Extremist Islamic actions, such as a terrorist atrocity or murder, strengthens far right extremist ideologies and sentiment. Moreover, this tendency is enhanced, over time, by a growing polarisation between EDL supporters against the wider anti-EDL and anti-Racist community. This strengthening is also increased by Muslims who are against anti-Muslim hate speech. Furthermore, it can be concluded that digital methods can portray offline realities, and can conclusively be used in order to study this phenomenon in more depth than traditional methods. There was no discovery of extreme Islamist discourse since they are using more private means of communication than an open platform like Twitter. Main clustering and discussion is evolved between the extreme far right versus the anti-fascist and anti-extremist. This fact leads us to the conclusion that they have a symbiotic relationship. EDL is centralized with top-down groups of users while anti-EDL is more decentralised. Both parties are extremely active though. Reconciliation efforts generally perpetrated by individual users and some key members of the community. In 2013, eight years since al-Qaeda inspired terrorists had last killed people on British soil during the 7/7 attacks1, homegrown Islamic extremists Michael Adebowale and Michael Adebolajo brutally murdered an off-duty British soldier, Drummer Lee Rigby of the Royal Regiment of Fusiliers, in the middle of a street in Woolwich, South-East London. On the afternoon of 22nd May and armed with a meat cleaver and knives, the attackers ran the soldier over with a car before Adebolajo attempted to decapitate him2, whilst Adebowale hacked at his body until he died at the scene. With the blood of the victim on his hands, Adebolajo tried to justify the murder through the lens of a camera after urging a passerby to record a video of him², where he states that we must fight them like they fight us, an eye for an eye and a tooth for a tooth. Neither of the murderers attempted to flee or hide, nor did they attack onlookers, instead waiting for armed police to arrive which they later charged at, and were subsequently shot and immobilized. Before receiving their prison life sentences in December, they claimed in court that they had wanted to be shot and killed, believing that it would make them martyrs (Manning). Paul Jackson depicts the EDL as a social movement gravitating around a new far right ideology, which consists of a loose set of views that presents a clear politicised approach to social issues by combining ultra-patriotism, a critique of mainstream politics, and an aggressive anti-Muslim agenda (Jackson 5). Although the group has a limited central organisational structure, it does offer a level of coherent organisation and a broad party manifesto to a wider set of networked followers (Jackson 5). However, it is also heavily reliant upon grassroots networks, such as the Casuals United organization4, and the initiative of regional leaders to develop its division-based activism (Jackson 5). This activity consists of series high profile street demonstrations that seek to whip up tensions and violence between Muslim and non-Muslim communities (Hope Not Hate, What is the English Defense League?; Jackson 5). For instance, soon after the Woolwich murder the EDL organised a protest march in London on the 27th May, where over 1,000 supporters chanted "there's only one Lee Rigby" and listened to former leader Tommy Robinson blame Islam for the Woolwich murders (Quinn). There is a clear symbiotic relationship between al-Muhajiroun and the EDL, as they feed off the other and justify their own existence by the existence of the other (Lowles and Mulhall 5). Recent years have seen an increased interest in the online presence of extreme far right groups. Although originally comprising of dedicated websites for the dissemination of hate content, the online British far right currently incorporates multiple networks, including social media platforms such as Facebook and Twitter, which are used for community formation around variants of extreme right ideology (OCallaghan et al.). Similarly, the EDL can be described as a social media led organisation that has sizeable and active presence throughout the aforementioned platforms. Furthermore, the first study of anti-Muslim sentiment in the UK found that EDL members were linked to a third of online abuse incidents in the past year (Copsey et al.). Hope Not Hate notes the group has certainly gained a large increase in social media followers since Lee Rigbys murder, however building an accurate picture of its membership has proved difficult (What is the English Defense League?). The news of the murder was quickly spread across the Internet through Twitter by an eyewitness who live tweeted the events of the murder at the scene. In addition, Adebolajos video brought large repercussions online, drawing 1.2 million visitors to ITVs website where the video was posted (Halliday). Therefore, it was a natural step to infer that this event of a shocking and political nature, and a fundamental part of which is a redistributable digital object, will have an impact on the discourse among the social media users. Richard Rogers has suggested a periodization based on how Twitter has been conceived as an object of study (Debanalizing Twitter). Starting from its initial development in 2006 until roughly 2009, Twitter was generally characterised as an ambient friend-following and messaging utility, or an urban lifestyle tool with many tweets on mundane activities such as lying in bed or taking a walk in the park (356). Research on the platform in this first stage or tradition (Twitter I) is often directed at determining the value of tweets and the degree to which messages are banal, thus focussing mostly on the content (357). Characterised by a tagline change from What are you doing? to Whats happening? in 2009, a second phase or tradition (Twitter II) conceives of Twitter as an event-following tool, a way to monitor, for instance, elections or disasters (Rogers, Digital Methods 359; Bruns and Liang). In 2010, Twitter introduced a Trending Topics section to users as an attempt to identify the hottest emerging topics of discussion, prompting co-founder Biz Stone to characterize the platform as a discovery engine for finding out what is happening right now. Trending Topics lends itself to the user furnished #hashtag, which acts as a device-specific method to organise tweets around specific users, groups, themes, or events. Similarly, tweets can also be directed at specific individuals, and it is through the @reply feature that public Twitter-based conversation occurs (boyd, Golder and Lotan). Scholars have also observed Twitters capacity to act as a tool for following, reporting, and breaking, news events (Arceneaux and Schmitz Weiss). During event related research, the #hashtag becomes the means to follow and mobilise actors, as well as to categorise sets of tweets in order to study an event online and follow the actions on the ground (Rogers, Digital Methods 360). This stage of Twitter research is thus gradually shifting towards a third phase or tradition (Twitter III) that is interested in Twitter as it is settling into a massive data set, which is of value to itself but is also of historical value as part of cultural heritage (Rogers, Digital Methods 362). Continuing in particular the second and third stages, in this study we relate dynamics of polarisation and reconciliation at four different points in time that are significant for what has come to be known as the Woolwich murder in online networked publics on Twitter to how those same dynamics play out as events on the ground (boyd). In other words, our objective is to study the spillovers or interactions between online and offline dimensions of a controversy with extremist actors. In a recent report, Chan, Ghose and Seamans have performed a similar type of study for racial hate crimes on the Internet between 1999 and 2008. Based on regression analysis, their study concluded that there is indeed a strong correlation between availability of Internet in particular areas and the numbers of racial hate crimes for those areas. Moreover, areas with greater levels of population density and racial segregation showed stronger results. This study, however, grounds its claims in the online, which means that we are not so much researching the Internet and its users, as studying culture and society with the Internet (Rogers, Digital Methods 38). In regards to dynamics of polarisation and reconciliation online, scholars have studied patterns of political polarisation among Twitter users and discovered that retweet-networks among users showed a clear polarization (Conover et al.). Users with extreme left or right-wing tendencies tend to retweet more from within their own communities rather than from the opposing ones. They retweet to redistribute and reinforce their own political views. Hashtags, however, were used to interact with the opposing communities so as to infiltrate or inject biased content into the information stream (Conover et al. 7). This pattern of aggravating or amplifying polarisation through provocation with extremist political comments has been identified as constituting an echo chamber (Sunstein; see also Rieder). The ephemerality of Twitter then points to the need to study the relationship between the events on the ground and the change of network patterns in online communication. Some scholars have presumed a correlation between them, specifically when the event was large in scale and involved multiple political stances (Thelwall; Mitchell and Hitlin). Mike Thelwall investigated the reason why certain events are subject to reverberation among the Twitter users, based on the assumption that strong emotions invoked by particular events are the driving force of the continuing resonance. Mitchell and Hitlin found that whether the nature of the events is positive or negative does not affect the general tendency of the emotions displayed on Twitter. During popular events, general sentiment on Twitter showed little change and the role of negative sentiment was far higher than the positive sentiment in the sharp increase of the number of Tweets during the events (Mitchell and Hitlin 10). Returning to the Woolwich murder, the news of the murder of Lee Rigby rapidly spread from the eye-witness Tweet via locals to the larger public. Five days later, extremist political actors such as the EDL had already physically mobilised in a protest march. Starbird, Muzny and Palen developed a machine learning process to classify twitter users, focusing on determining who is on site during a mass disruption event and who are the remote crowds (4). They considered the remote crowd mainly as a noise to filter out, because those on the ground can be a valuable source of information (3). This report does not contest the idea that Tweets composed by those who are physically present are valuable. Rather, its focus will embrace the remote crowd as a significant factor that exacerbates the polarisation in networked publics. In what way are dynamics of polarisation and reconciliation of the Woolwich controversy on Twitter reflected, influenced by, or otherwise correlated with events happening over time on the ground? There are limitations to understanding Twitter as a data provision machine, most importantly those related to Twitters ephemerality (Rogers, Debanalizing Twitter 362). Back et al. and Elmer have both enquired into how real-time research poses new challenges as a result of the problem of ephemerality. For Elmer, streams of data especially on Twitter pose new challenges to research on political communications campaigns, and the analysis of vertical tickers highlights the fleeting character of networked and socially mediated communications (25). Furthermore, Marres and Weltevrede offer an operational analytical framework as they investigate the device of scraping. In particular, they show how scraping imports analytical presumptions into the research, and also that scrapers import data that is already pre-formatted. As a consequence of this, they raise the question of whether the research helps to bring into view the dynamics of media platforms or also those of the social phenomena they enable? To operationalise that question, they suggest a distinguish between two kinds of real-time research: those dedicated to monitoring live content (which terms are current?) and those concerned with analysing the liveliness of issues (which topics are happening? ) (Rogers, Debanalizing Twitter 356). Where live social research renders analytically productive the formatted, dynamic character of digital networked data (Marres and Weltevrede 15), which means that it makes possible the study of changing natively digital objects, research on liveliness on the other hand aims to capture what is currently happening in a particular social space; which actors are the most active and make things happen in the eternal now. Drawing from a general dataset of Twitter messages concerning the murder of Lee Rigby, and the presence and interaction of the EDL in particular, we aim to analyse how dynamics of polarization and reconciliation in online Twitter networks are reflected by events happening over time on the ground and vice versa. The dataset comprises a historical set of tweets acquired from data reseller Gnip6 that was imported into Digital Methods Initiative Twitter Capturing and Analysis Toolset (DMI-TCAT)7. The dataset woolwich_historical comprises roughly 1.8 million tweets extracted from the period between the 21st May and 22nd June 2013. Within this dataset, tweets are captured if at least one of the following keywords is used: woolwich, leerigby, ripleerigby, leerigbyrip, rigby, edl, bnp, duggan, markduggan, or adebolajo. However, it should be noted that as we have worked with a historical dataset from Gnip we did not specify the above query design ourselves. As Rogers points out the #hashtag included in a tweet becomes the means to follow a certain topic online (Debanalizing Twitter 360). By using a digital methods approach one can categorize a set of tweets based on the keywords and technical metrics used in the message. Nevertheless, it is also important to note that any Twitter user can select arbitrary hashtags to annotate his or her tweets. This also allows users to produce tweets with multiple unrelated or even contradicting hashtags in order to reach a wider audience, or to magnify their viewpoint to a specific user group. The latter is a common practice that Conover et al. describe as content injection (94). As a consequence we have to take into account that the dataset contains arbitrary messages. For example, the keyword woolwich returns many messages about the region that are not related to the actual murder, and to a bigger extent, tweets with the keyword rigby show up because Rigby itself is a common British surname. Fig. 1: Overview of the full woolwich_historical dataset, as captured from May 21st, 2013 to June 22, 2013. Source: DMI Twitter Capturing and Analysis Toolset (DMI-TCAT) (https://tools.digitalmethods.net/coword/twitter/analysis/). Fig. 2: Twitter interaction frequency spikes in the woolwich_historical dataset between May 1st, 2013 and June 6th, 2013. Source: DMI Twitter Capturing and Analysis Toolset (DMI-TCAT) (https://tools.digitalmethods.net/coword/twitter/analysis/). More specifically, this research examines how groups of Twitter users are formed around the reactions of the Lee Rigby murder and subsequent related events. 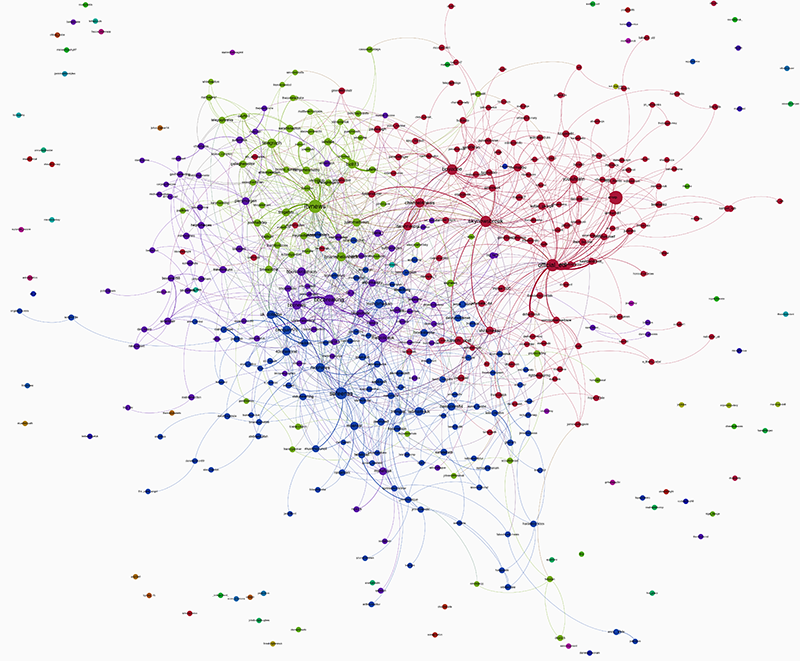 By analyzing the key actors for each cluster, we aim to compare polarization and reconciliation as indicated by the connectivity in mention graphs, with events on the ground. There are four distinct spikes in Twitter activity throughout the woolwich_historical dataset (Figure 2). The major spike occurs on the 22nd May, soon after the murder of Lee Rigby takes place. The second spike is on 27th May, as on this day the EDL held a march with over 1,000 supporters to protest against Islam and the death of Rigby. The third spike takes place on 1st June, on this day Adebolajo is charged with the murder of Rigby, and the last spike is on 5th June, when Adebolajos pre-trial hearing is held. To get a better understanding of the content in Twitter messages, this study first looks at the general statistics for each day. We analyzed the top RT to see which messages were the most popular, we identified the key actors to see who is participating in this debate, and we mapped out the most popular hashtags for each day to see whether the emphasis changed over time. We used the social graph by mentions dataset to illuminate communities and key actors surrounding the online communication about the Woolwich murder. In order to portray how the communities and key actors changed over time, we compared the mention graph for each selected day. The mention graphs show which users are the most mentioned, and which users tweet, or mention other users, the most often. The more often a user mentions another, the stronger the link. Analyzing how hashtags are used in conjunction with one and other allows for a better understanding of the key themes in the conversation taking place within our dataset. Using the DMI-TCAT tool, we analyzed co-hashtag graphs for the aforementioned spikes in the activity graph. 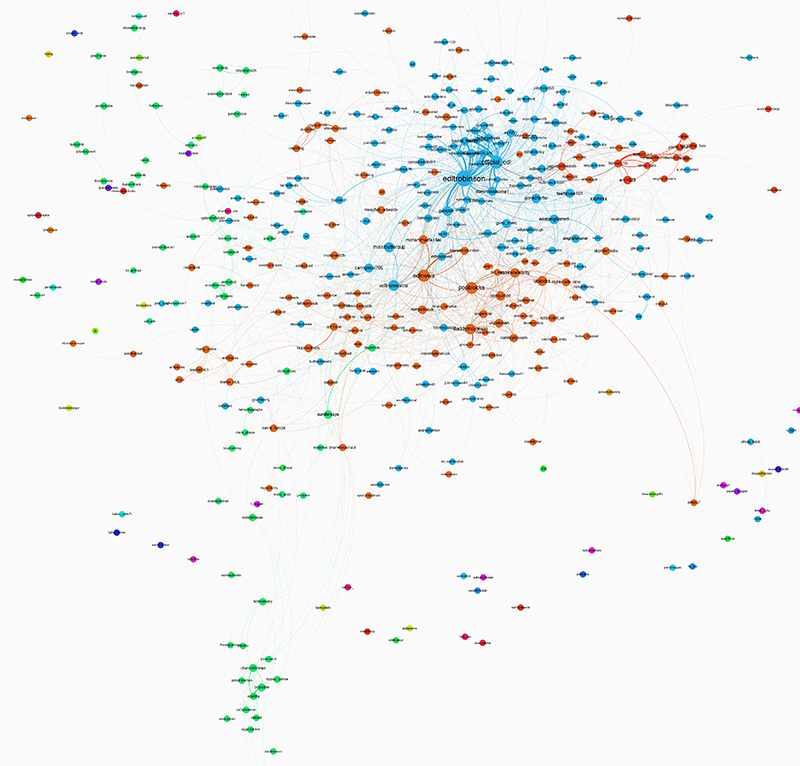 By downloading the hashtag co-occurrence data, we were able to generate the graphs in Gephi, in these undirected graphs each hashtag forms a connection with another hashtag if they are used in a tweet together. The more often they appear together, the stronger the link. By comparing the co-hashtag graphs along with the hashtag frequency charts we will be able to see which was the dominant figure within the discussion and with whom it was interacting. Comparing these findings with the mention analysis we will be in a position to analyze the polarization of the platform with more evidence supporting our claims. The Gephi visualisation software was used to generate both the mention and co-hashtag graphs. ForceAtlas2, a built in algorithm, allowed the graphs to be consistently representative of the dataset. 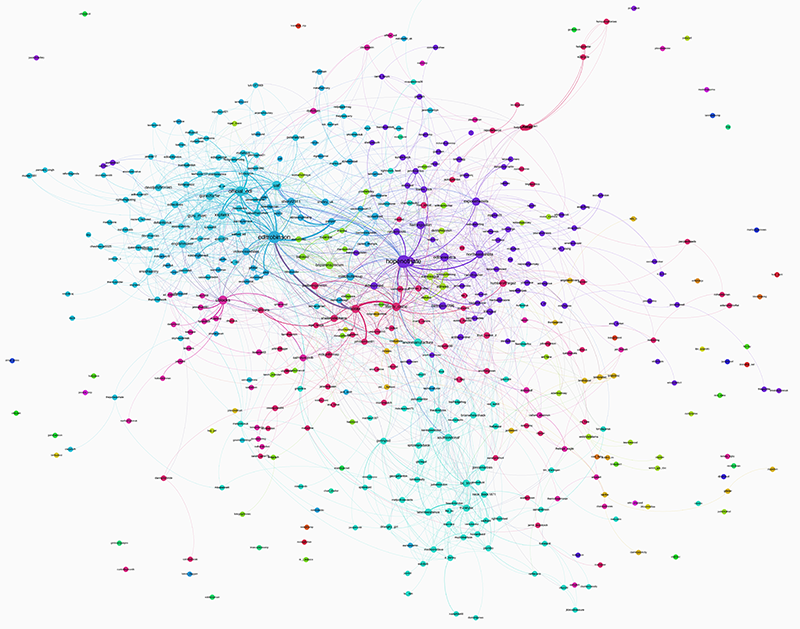 Co-mention graphs were clustered and colored based on modularity class, and the nodes ranked by degree (size of the node). Settings such as scaling, gravity, and prevent overlap were utilized in order to make the visualizations more readable and explicative. In the preview workspace, settings such as node outline color, curved edges, fonts, and transparency were manipulated to make the graphs more aesthetically pleasing. In addition, we tried to backup or complement our findings about polarization and reconciliation with sentiment analysis of the most popular EDL tweets. Since we could not locate distinct extremism clusters by scraping extremist keywords and hashtags, we could not directly compare extremist right sentiment with jihadist sentiment around the murder of Rigby. Therefore we choose to create a subset of the most popular EDL messages. We used the DMI-TCAT tool and filtered the days with the aforementioned spikes to analyse for tweets which contained the keyword EDL. We then extracted all the messages from this subset that were RT at least two times to get the most popular content. With SentiStrength8 we were able to extract sentiment values for each individual tweet, based on a predefined dictionary SentiStrength applies both a positive and a negative value to each message. Words in the dictionary range from 1 and 5 for positive, and -1 and -5 for negative sentiment, where 1 and -1 signifies neutral sentiment. We then collected the sentiment values for every message and counted the total amount of messages for each of the five sentiment values. The totals for each day are made into a visualization which shows the degree of positive and negative sentiment relative to the total dataset. Located directly above this interconnected cluster, we can identify a secondary green cluster around the dominant and highly valiant node @itvnews, one of the biggest news organizations in Britain. This node is surrounded by a majority of other news related nodes such as that of @TimGattITV, an Editor for ITV, the @Telegraph newspaper, @brianwhelanhack, a Channel 4 and Sunday Times reporter, and the London talk radio station LBC 97.3 (@lbc973). Most mentions: @bbcbreaking (11,537), @Official_edl (11,024), @SkyNewsBreak (9,446), @piersmorgan (5,278), @Boyadee (4,927). Most tweets: @Errotp (195), @SafeensS (81), @joncarlosguerra (78), @bnp_manten (52), @DefiantLionUK (50). Moreover, @HelpforHeroes is surrounded by 3 visible anti-EDL and anti-racist users that account for the highest amount of tweets that day, in order of @pooblocks, @NorseFired, @RacistBasher, and @malcolmite, who make up this cluster with a majority of other anti-extremist users. The biggest nodes towards the right of the graph, are composed of journalists and authors, including @trillingual (Daniel Trilling) the author of Bloody Nasty People: the Rise of Britain's Far Right, and @OwenJones84. Other notable nodes that make up this spectrum of conversation are @EDLNewsXtra, which reports on EDL activities that they dont want you to hear, and the official account of Unite Against Fascism (@uaf), who generally inject anti-EDL content into the debate. In addition, we can notice that @anjemchoundary (Anjem Choudary), the radical Islam cleric who was closely associated with Lee Rigbys murderers, has an insignificant presence in the conversation due to an extremely low amount of connections with other nodes. 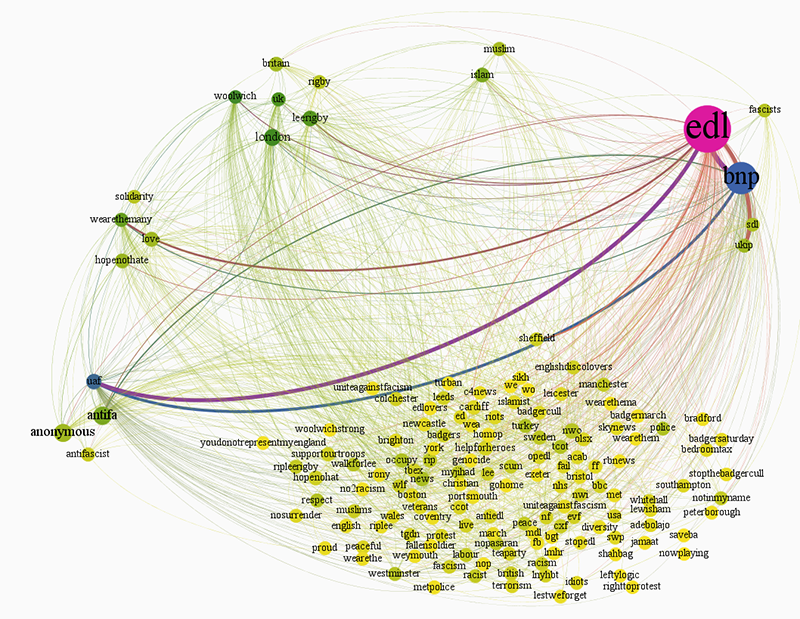 Most mentions: @helpforheroes (4,219), @EDLTrobinson (3,241), @flashboy (3,177), @official_edl (2,588), @owenjones84 (1,844). Most tweets: @pooblocks (329), @norsefired (223), @racistbasher (211), @malcolmite (196), @ublocks (169). After spending 9 days in hospital due to having been shot by police at the murder scene, news of Michael Adebolajo being charged for the murder of Lee Rigby, the attempted murder of two police officers and possession of a firearm, dominated British headlines on the 1st June (BBC News). Moreover, there were also BNP and EDL demonstrations across the country which were met by anti-fascist counter-protests by members of, amongst others, the UAF and Hope Not Hate, which resulted in a series of arrests (ref). @XxPLWxX: UAF claiming they outnumbered EDL in many places today........ Yeah in police cells. @kle_b: ""@hopenothate: For rejecting hate #UKIP MEP @Marty_Caine calls the Rigby family idiots/ http://t.co/BXySxMxvwA "" what a monster! Furthermore, the notable presence of @599bt, who produced the highest amount of tweets that day at 195, is also visible in the graph. The following is an example of one of the users top tweets, which highlights the fact that far right groups such as the EDL were exploiting and capitalizing on Lee Rigbys name to further heighten tensions between two communities and achieve their anti-Muslim goals. 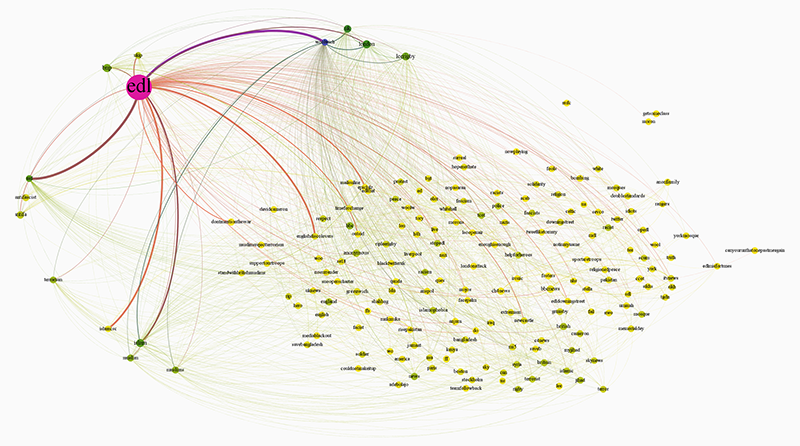 Most mentions: @hopenothate (3,204), @EDLTrobinson (2,507), @official_edl (1,943), @billbragg (1,196) @uaf (1,058). Most tweets: @599bt (185), @unblocks (172), @poppypride1 (165), @bnparenazsicum (148), @sheryl2311 (125). On this day the news media reported that counter-terrorism police confirmed evidence of EDL graffiti at the site of a partly burned down mosque in Muswell Hill, North London (Meikle, Taylor and Dodd). Furthermore, the EDLs leader Tommy Robinson denied any role in the attack and labelled it disgusting, however the police were attempting to establish a link between the attack and the group, which was unproven but remained the most serious incident of reported abuse against the Muslim community since the Woolwich murder (Philby, Masters and Peachey). @WaheedALiii: Why test on animals when we have EDL members? Most mentions: @EDLTrobinson (2,357), @official_edl (1,012), @edlnews (418), @bbcbreaking (402), @edlnewsxtra (396). Most tweets: @panpot_ (191), @jodanielross (165), @daddymojorisin (146), @pooblocks (146), @bambi_feehily (141). As news of the savage attack exploded on Twitter a myriad of different hashtags were created and used across the platform by users. In Figure 7, we can observe that a hashtag topology had not yet been established, hence the widespread use of a varying amount of hashtags. 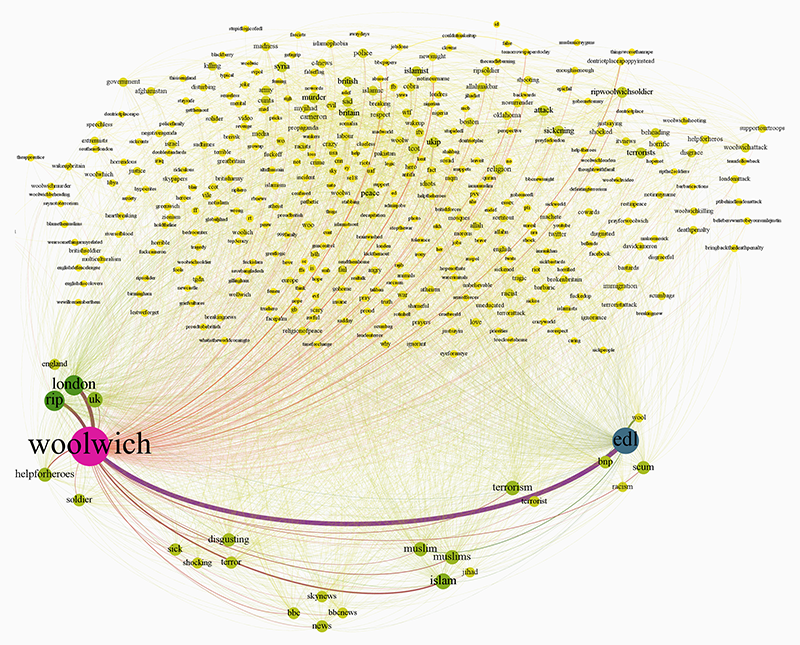 As far as the co-hashtag analysis is concerned, #Woolwich along with the location hashtags form the dominant cluster. The second ranked cluster is formed with hashtags associated with the British far right wing, and #EDL is the dominant figure. The discourse is also formed around Islamic related hashtags such as #islam, #muslims, and #jihad. Finally, smaller in use but still significant within our topic of discussion, are the hashtags regarding the news (#bbc, #skynews, #bbcnews, #news), and sentiment (#sick, #shocking, #disgusting, #terror). Over the course of events, dominant hashtags began to prevail and the total number of used hashtags radically decreases. Meanwhile, the total sum of the hashtags used at least 3 times was 236,820. Figures 8a and 8b below illustrate the dominance of #Woolwich, used 151,876 times (81% of the top 10 hashtags). On the other hand, the hashtag #EDL was used 14,803 times and was the 2nd most popular (8% of the top 10 hashtags). This finding is related to the fact that the EDL intervened as a dominant force in online conversation on this day, however their hashtag #EDL was also appropriated by an overwhelming amount of users who condemned the far right group and its racist narrative. Fig. 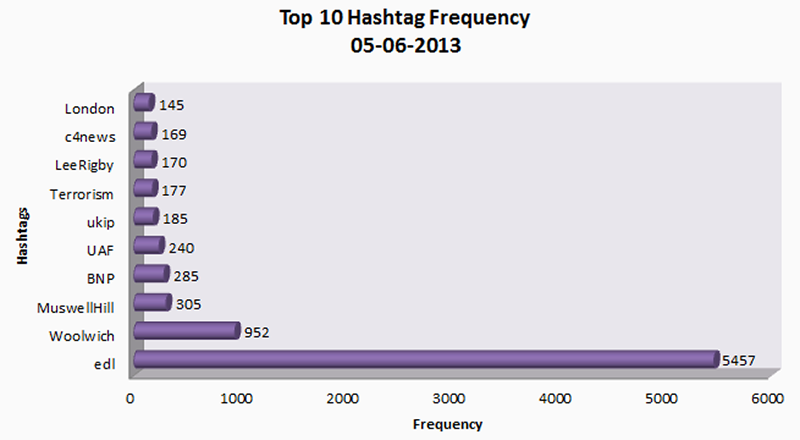 8a: Top 10 hashtag frequency for 22nd May 2013 in the woolwich_historical dataset. Data from DMI Twitter Capturing and Analysis Toolset (DMI-TCAT) (https://tools.digitalmethods.net/coword/twitter/analysis/). Fig. 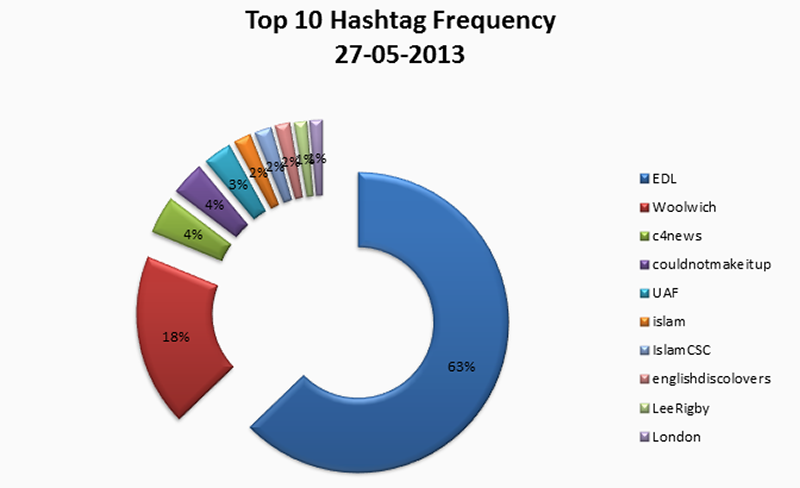 8b: Top 10 hashtag frequency for 22nd May 2013 in the woolwich_historical dataset represented as percentages. Data from DMI Twitter Capturing and Analysis Toolset (DMI-TCAT) (https://tools.digitalmethods.net/coword/twitter/analysis/). On 27th May, the EDL organized a march with more than 1,000 supporters protesting against Islam and the death of Lee Rigby near Downing Street in London. During this day, the hashtags in our dataset were used 52,297 times with a minimum frequency of 3, and it is interesting to observe that #Woolwich was mostly used the day of the murder as a way to spatially locate new conversation within the Twitter platform. However on 27th May, it was not so important anymore for the conversation to include so many locational hashtags. This reason along with the fact that the EDL had organized a demonstration, may exemplify why #EDL becomes the most frequently used hashtag in Figures 10a and 10b below. More specifically, the string #EDL appears 21,984 times throughout the tweets within our data set and dominates the top 10 frequency by 62%. The second most prominent hashtag is #Woolwich, since it has been used 6,464 times. It still remains one of the key hashtags in the conversation covering 18% of the top 10 hashtags. The relationship between EDL and Woolwich is depicted in the top section of Figure 9. The locational hashtags are occupying the top right corner of the graph still rallying significant prominence. In the bottom left corner of the graph below the islamist hastags appear along with the smaller in scale use of anti-fascist hastags. Fig. 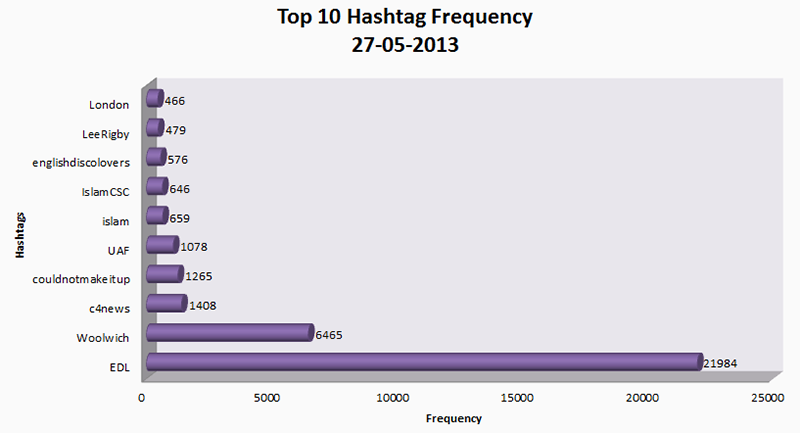 10a: Top 10 hashtag frequency for 27th May 2013 in the woolwich_historical dataset. Data from DMI Twitter Capturing and Analysis Toolset (DMI-TCAT) (https://tools.digitalmethods.net/coword/twitter/analysis/). Fig. 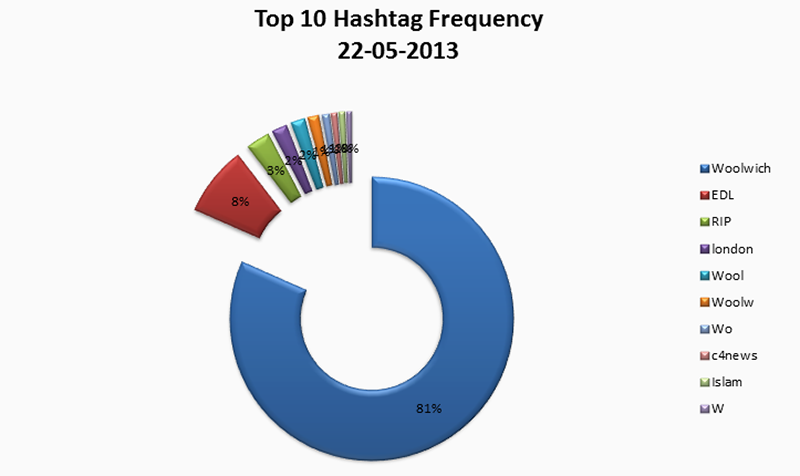 10b: Top 10 hashtag frequency for 27th May 2013 in the woolwich_historical dataset represented as percentages. Data from DMI Twitter Capturing and Analysis Toolset (DMI-TCAT) (https://tools.digitalmethods.net/coword/twitter/analysis/). Before proceeding we have to stress the fact that on June 1st the number of tweets, and therefore the use of hashtags, had been declined in comparison with the day of the murder. As visible in the top right part of Figure 11 below, #EDL is once again the biggest node since it is related with most of the other hashtags. Along with #BNP, #SDL and #UKIP, they create the far right wing of the conversation. The other side of the graph is occupied by the anti-EDL polar of the discussion which is consisted of the campaign by the Hope not Hate movement and the anti-fascist hashtags. Although the discourse is polarised between the far right and the anti-fascist clusters, the appearance of hashtags like #HopeNotHate, #WeAreTheMany, #love and #solidarity gives the first signs of reconciliation in the platform. Moreover, the dominance of EDL is not only found in form of interaction but also in the frequency of appearance as it can been seen in the Figures 12a and 12b below. Nevertheless, we can detect a shift to reconciliation here as well, since #WeAreTheMany is in the second place of the frequency charts. Fig. 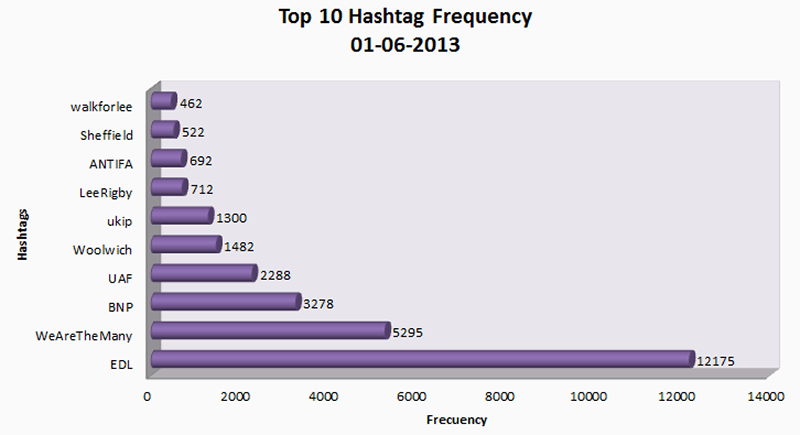 12a: Top 10 hashtag frequency for 1st June 2013 in the woolwich_historical dataset. Data from DMI Twitter Capturing and Analysis Toolset (DMI-TCAT) (https://tools.digitalmethods.net/coword/twitter/analysis/). Fig. 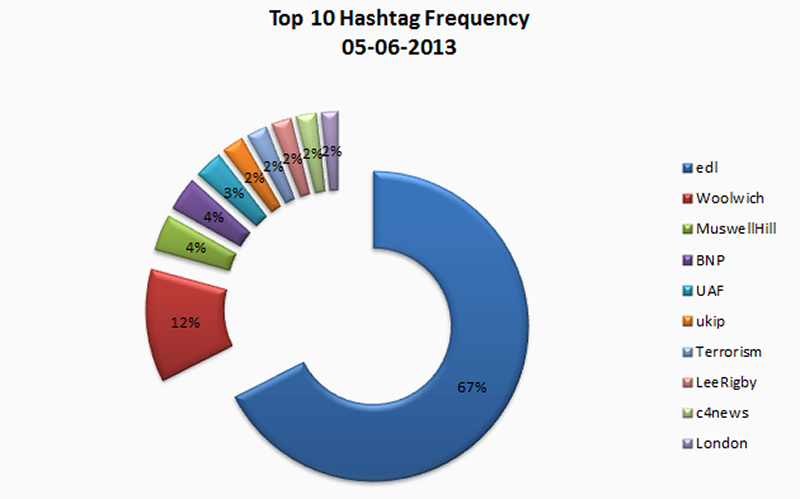 12b: Top 10 hashtag frequency for 1st June 2013 in the woolwich_historical dataset represented as percentages. Data from DMI Twitter Capturing and Analysis Toolset (DMI-TCAT) (https://tools.digitalmethods.net/coword/twitter/analysis/). On 5th June an arson attack took place at the mosque in Muswell Hill. Thereafter, new hashtags also appeared and the new incident, which was considered the most extreme activity against the muslims after the murder, was heavily discussed online. The discussion was built around the far right side again, because of the EDL graffiti at the burned down mosque, and as we can see in Figure 13 below #MuswellHill is strongly connected with #EDL. English Defence League engages with both islamic and anti-fascist hashtags. Moreover, #islamophobia and #racist are correlated with them. Four days after Adebolajo was charged with the murder of Lee Rigby, the total amount of tweets had dropped to 29,657. Regarding the hashtag frequency, as we can see in Figures 14a and 14b below, EDL was again in the first place followed by two locational hashtags. Fig. 14a: Top 10 hashtag frequency for 5th June 2013 in the woolwich_historical dataset. Data from DMI Twitter Capturing and Analysis Toolset (DMI-TCAT) (https://tools.digitalmethods.net/coword/twitter/analysis/). Fig. 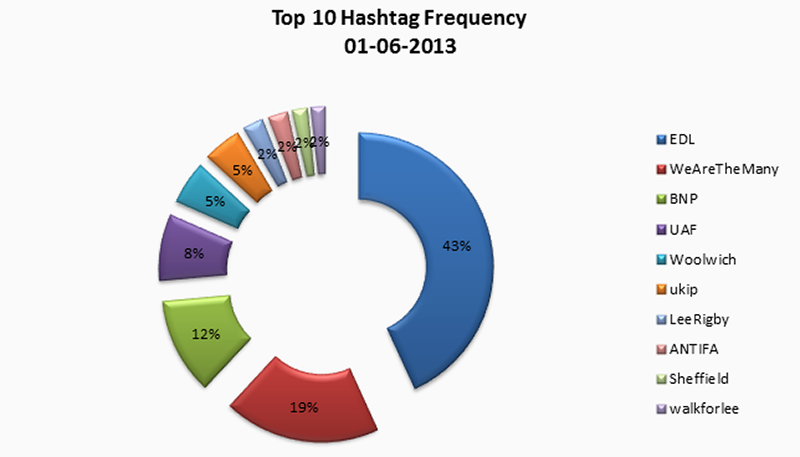 14b: Top 10 hashtag frequency for 5th June 2013 in the woolwich_historical dataset represented as percentages. Data from DMI Twitter Capturing and Analysis Toolset (DMI-TCAT) (https://tools.digitalmethods.net/coword/twitter/analysis/). The Woolwich hashtag is the one mostly used during the selected days. In terms of the discussion though, this hashtag is neutral regarding the polarization because it has locational features. EDL monopolizes the interest of the discussions since it is dominant in both the Co-Hashtag graph and the Frequency chart. This is an indication of polarization which can be fully verified when compared with the mention analysis. We can observe an interaction between the EDL and anti-fascists. Signs of reconciliation can be seen with the appearance of Hope not Hate movement on June 1st. The hashtags #love and #solidarity indicate positive emotions. Using SentiStrength (developed by Mike Thelwall) allows the detection of both positive and negative value. Although the method is flawed, the analysis showed that positive sentiment (yellow bars) is generally more neutral (mostly either classified as +1 to +2), whereas negative sentiment (red bars) generally tends to be expressed in stronger language (ranging from -2 to -5). Furthermore, the size of the accumulative bars indicates the absolute number of tweets to which these sentiment values are assigned. On May 27th and June 1st, the absolute amount of sentiment is thus higher than for the other three measured points in time (Figure 15). Fig. 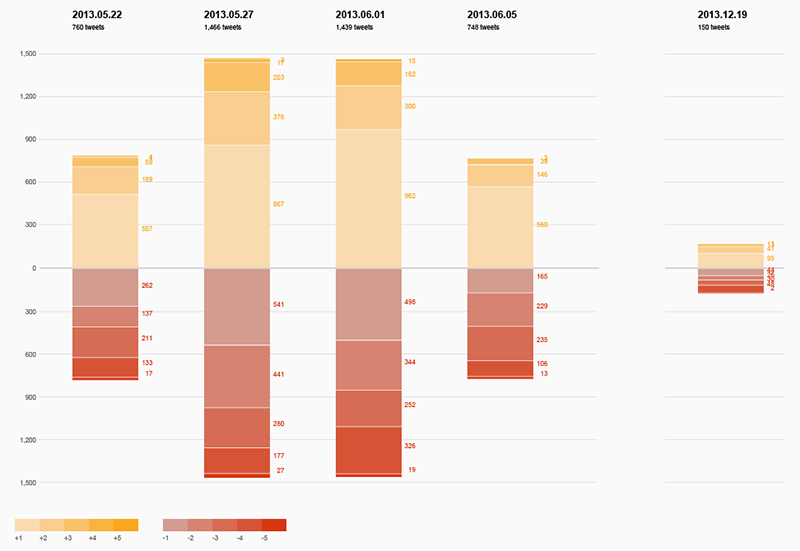 15: Retweet sentiment analysis for [EDL] and with at least 2 retweets. Data from DMI Twitter Capturing and Analysis Toolset (DMI-TCAT) (https://tools.digitalmethods.net/coword/twitter/analysis/), analysed with SentiStrength (https://tools.digitalmethods.net/beta/senti/). We describe how although considered a clear terrorist attack, such an attack on a relatively small scale which only mercifully only claimed 1 viction had a massive societal impact online. The Woolwich hashtag is the one mostly used during the selected days. In terms of the discussion though, this hashtag is neutral regarding the polarization because it has locational features. We document the almost instant seize of the incident by the British far right, and the continuation of dominant EDL-related discourse throughout online conversation over the course of the murders related events. The fact that EDL monopolizes the interest of the discussions since it is dominant in both the Co-Hashtag graph and the Frequency chart. In addition, we also document the opposition to the EDL, dominated by counter groups such as the UAF who engage in violence offline and discussion online with the EDL. Having in hand the Co-Hashtag, the mention and the frequency graphs we were in the position to compare them and analyze the polarization of the discussion online. Hence, we document a notable online polarization of two separate communities. This fact supports the concept of the echo chamber as originally proposed by Cass Sunstein. One side depends on the existence of the other, and by the communities engaging in this dialogue, they build up their prominence. Beyond responding to each other, the echo chamber effect applies within groups as well, as demonstrated through the clustering of similar hashtags and users. While there was obvious polarization between communities, there were also growing attempts for reconciliation. For example, by the hashtag analysis we found the first signs of reconciliation with the appearance of Hope Not Hate on 1st June. On 27th May, a mosque, in response to the destruction of another mosque by an arson attack, invited members of an EDL march for tea and biscuits in order to start a dialogue and attempt to work out their differences, at least when it came to violence on the streets. The wider twitter community supported this kind of discussion between the groups and the hashtags #love and #solidarity indicate positive sentiment. To conclude, this report could benefit from expanded sentiment analysis, which, at this point, was not possible mostly due to time constraints and technological problems. However, it would be valuable to detect and measure growing extremist or anti-muslim sentiment. 1. 7/7 is a reference to the 7th July 2005 London bombings, which were a series of coordinated suicide attacks by extremist Islamic terrorists in central London that killed 52 civilians and injured over 700. 2. Uncensored video footage of Michael Adebolajo moments after the murder of Lee Rigby. Source: <https://www.youtube.com/watch?v=rckLU3_nCGM>. 4. Casuals United is a British far-right protest group that describes itself as Uniting the UK's Football Tribes against the Jihadists. Souce: <http://www.hopenothate.org.uk/news/article/1761/edl-rejects-barnbrook-approach>. 5. One good example is the #MyJihad hashtag, which constitutes a contested space on Twitter. 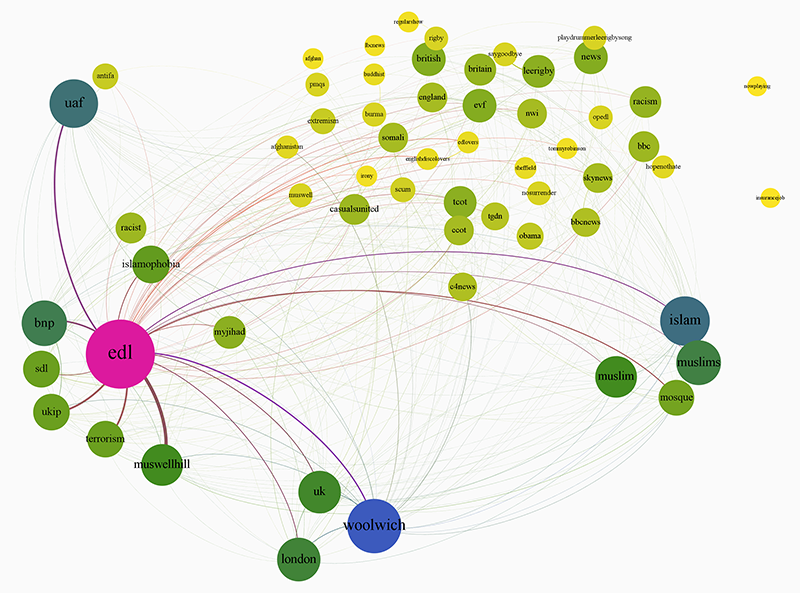 Source: <https://wiki.digitalmethods.net/Dmi/Winter2014Project13> (Accessed 20th January 2014). 7. DMI Twitter Capturing and Analysis Toolset. Source: <https://tools.digitalmethods.net/coword/twitter/analysis/index.php?dataset=woolwich_historical&query=&url_query=&exclude=&from_user_name=&startdate=2013-05-22&enddate=2013-06-05&whattodo=>. 8. DMI SentiStrength. Source: <https://tools.digitalmethods.net/beta/senti/>. Abbasi, Ahmed, Chen, Hsinchun and Salem, Arab. Sentiment Analysis in Multiple Languages: Feature Selection for Opinion Classiﬁcation in Web Forums. ACM Transactions on Information Systems 26.3 (2008): 1234. Print. About Us. HOPE not hate. n.d. Web. 16 Jan. 2014. <http://www.hopenothate.org.uk/about-us/>. Alker, Hayward R., and Kinhide Mushakoji. "Three Times for Tomorrow. Conferencia Internacional a Construcao do Tempo e os Futuros Possiveis. Rio de Janeiro, 12 May 1999. Print. Arceneaux, Noah, and Amy Schmitz Weiss. Seems Stupid until You Try It: Press Coverage of Twitter, 20069. New Media & Society 12.8 (2010): 1262-1279. Print. Back, Les, Celia Lury, and Robert Zimmer. Doing Real Time Research: Opportunities and Challenges. Goldsmiths College, University of London, 2013. Print. Borra, Erik K, and Bernhard Rieder. Programmed Method: Developing a Toolset for Capturing and Analyzing Tweets. Unpublished manuscript. Print. boyd, danah m, and Alice Marwick. Social Privacy in Networked Publics: Teens Attitudes, Practices, and Strategies. A Decade in Internet Time: Symposium on the Dynamics of the Internet and Society, 2011. Print. boyd, danah m, Scott Golder, and Gilad Lotan. Tweet, Tweet, Retweet: Conversational Aspects of Retweeting on Twitter. Proceedings of the 43rd Hawaii International Conference on Social Systems (HICSS) (2010): 111. Print. Bruns, Axel, and Yuxian Eugene Liang. Tools and Methods for Capturing Twitter Data During Natural Disasters. First Monday 17.4 (2012): n.pag. Web. 18 Jan. 2014. <http://pear.accc.uic.edu/ojs/index.php/fm/article/view/3937/3193>. Conover, Michael D et al. Political Polarization on Twitter. 5th International AAAI Conference on Weblogs and Social Media (2011): 18. Print. Copsey, et al. "Anti - Muslim Hate Crime and the Far Right." Middlesbrough: Centre for Fascist, Anti-Fascist and Post-Fascist Studies, Teesside University, June 2013. Print. Elmer, Greg. Live Research: Twittering an Election Debate. New Media & Society 15.1 (2013): 1830. Print. Grierson, James. Timeline in Lee Rigby Woolwich murder case. The Independent. 19 Dec. 2013. Web. 14 Jan. 2014.<http://www.independent.co.uk/news/uk/crime/timeline-in-lee-rigby-woolwich-murder-case-9015702.htm>. Jackson, Paul. The EDL: Britains New Far Right Social Movement. RNM Publications. Northampton: Radicalism and New Media Research Group, University of Northampton, 2011. Print. Laville, Sandra, Peter Walker, and Vikram Dodd. Woolwich attack suspect identified as Michael Adebolajo. The Guardian. Guardian News and Media Limited, 23 May 2013. Web.15 Jan. 2014. <http://www.theguardian.com/uk/2013/may/23/woolwich-attack-suspect-michael-adebolajo>. Lowles, Nick. Counter Jihadism: Introduction. HOPE not hate. 24 Aug. 2012. Web. 21 Dec. 2012. <http://www.hopenothate.org.uk/counter-jihad/>. Lowles, Nick, and Joe Mulhall. Gateway to Terror: Anjem Choudary and the al-Muhajiroun network. HOPE not hate: London, 2013. Manning, Lucy. Lee Rigby's murderers wanted martyrdom  they will get jail. ITV News. ITV plc, 19 Dec. 2013. Web. 20 Jan. 2014. <http://www.itv.com/news/2013-12-19/lee-rigbys-murderers-wanted-martyrdom-theyll-get-jail/>. Marres, Noortje S, and Esther Weltevrede. Scraping the Social?. Journal of Cultural Economy 6.3 (2013): 313335. Print. Marres, Noortje S, and Richard A Rogers. Subsuming the Ground: How Local Realities of the Fergana Valley, the Narmada Dams, and the BTC Pipeline Are Put to Use on the Web. Economy and Society (2008): 251281. Print. Marwick, Alice E, and danah m boyd. I Tweet Honestly, I Tweet Passionately: Twitter Users, Context Collapse, and the Imagined Audience. New Media & Society 13.1 (2011): 114133. Print. Meikle, James, Matthew Taylor and Vikram Dodd.  Police investigate fire at Islamic community centre in Muswell Hill. The Guardian. Guardian News and Media Limited, 5 June 2013. Web. 16 Jan. 2014. <http://www.theguardian.com/uk/2013/jun/05/fire-islamic-community-centre-muswell-hill>. Mitchell, Amy, and Paul Hitlin. Twitter Reaction to Events Often at Odds with Overall Public Opinion. Pew Research Center. 4 Mar. 2013. Web. 18 Jan. 2014. <http://www.pewresearch.org/2013/03/04/twitter-reaction-to-events-often-at-odds-with-overall-public-opinion/>. Moon, Timur. Ukip Activist Marty Caine Provokes Fury by Branding Drummer Lee Rigby's Family 'Idiots'. International Business Times. 1 June 2013. Web. 14 Jan. 2014. <http://www.ibtimes.co.uk/lee-riby-marty-caine-idots-ukip-473545>. OCallaghan, Derek et al. Uncovering the Wider Structure of Extreme Right Communities Spanning Popular Online Networks. Proceedings of the 5th Annual ACM Web Science Conference (2013): 276-285. Print. Pipes, Daniel. The U.S. Institute of Peace Stumbles. Daniel Pipes: Middle East Forum. 23 March 2004. Web. 15 Jan. 2014. <http://www.danielpipes.org/1659/the-us-institute-of-peace-stumbles>. Puschmann, Cornelius, and Jean Burgess. The Politics of Twitter Data. Alexander von Humboldt, Institut Für Internet und Gesellschaft, 2013. Print. Quinn, Ben. EDL Blames Islam for Woolwich Attack at Downing Street Protest. The Guardian. Guardian News and Media Limited, 27 May 2013. Web. 15 Jan. 2014. <http://www.theguardian.com/uk/2013/may/27/edl-protesters-blame-islam-woolwich-attack>. Rieder, Bernhard. The Refraction Chamber: Twitter as Sphere and Network. First Monday 17.11 (2012): n. pag. Web. <http://firstmonday.org/ojs/index.php/fm/article/view/4199/3359>. Rogers, Richard A. Debanalizing Twitter: the Transformation of an Object of Study. Proceedings of the 5th Annual ACM Web Science Conference (Web Sci '13) (2013): 356365. Print. ---. Digital Methods. Cambridge, MA: The MIT Press, 2013. Print. Simcox, Robin et. al. Islamist Terrorism: The British Connections. 2nd ed. London: The Henry Jackson Society, 2011. Print. Starbird, Kate, Grace Muzny, and Leysia Palen. Learning From the Crowd: Collaborative Filtering Techniques for Identifying on-the-Ground Twitterers During Mass Disruptions. Proceedings of the 9th International ISCRAM Conference (2012): 110. Print. Stone, Biz. Twitter Search for Everyone! Twitter Blog. Twitter Inc., 2009. Web. 3 Dec. 2013. <https://blog.twitter.com/2009/twitter-search-everyone>. Sunstein, Cass. Fragmentation and Cybercascades. Republic.com. Princeton: Princeton University Press, 2001. 5188. Print. The Al-Muhajiroun Network. HOPE not hate. n.d. Web. 15 Dec. 2014. <http://www.hopenothate.org.uk/hate-groups/am/>. Thelwall, Mike, Kevan Buckley, and Georgios Paltoglou. Sentiment in Twitter Events. Journal of the American Society for Information Science and Technology 62.2 (2011): 406418. Print. Thelwall, Mike. Sentiment Strength Detection for the Social Web. Journal of the American Society for Information Science and Technology 63.1 (2012): 163173. Print. What is the English Defence League?. HOPE not hate. n.d. Web. 15 Dec. 2014. <http://www.hopenothate.org.uk/hate-groups/edl/>. Woolwich: Michael Adebolajo charged with Lee Rigby murder. BBC News UK. British Broadcasting Company, 1 June 2013. Web. 16 Jan. 2014. <http://www.bbc.co.uk/news/uk-22743438>. Woolwich: The Untold Story. BBC Panorama. BBC One, British Broadcasting Company. 19 Dec. 2013. Television.